A sun face wall décor adds a festive and upbeat splash to casual living spaces like sunrooms, patios, and family rooms. If you want to incorporate a symbolism of happiness and brightness into your home, then you most definitely need to check out our buying guide on sun face wall decorations below! A home's foyer or entryway is an excellent place to set an upbeat and welcoming tone for the entire home, and you can do so with a sun face wall décor! In fact, it is the most effortless way of changing a room's mood or feel. 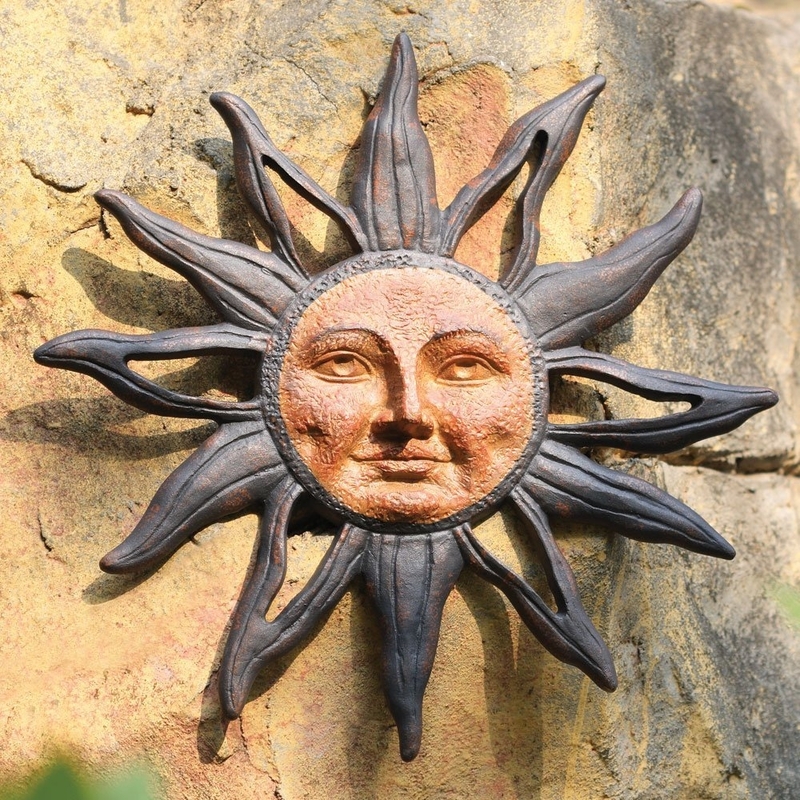 A sun face or sunburst wall decor reflects a cohesion of modern styles and traditional designs. Since various units proliferate in the online market, there's a need for you to learn everything there is to know about them including their different forms, types, and uses. The usual forms that have been taken up by this kind of décor are semi-elliptical, semi-circular, and full circle. A full circle is the most ingenious configuration as it displays the entire face of the sun with rays surrounding the entire piece. As for the semi-elliptical, it's resembling an oval shape that's split into two. As for the semi-circular design, it's a full round circle that's divided into two halves. Above the Sofa - The ideal placement of a sun face wall décor is 6 to 12 inches above the topmost part of a sofa. Above the Fireplace - A wall décor with a sun's face should be at least 6-7 inches above a mantle or fireplace. For a relaxed look, the wall décor may be set on the mantle directly, leaning against the wall. General Placement - Most homeowners love grouping several different sun face wall accessories. If that's what you're planning to do as well, give each wall décor some breathing room. Don't hang them too close to each other to make the room feel spacious and not cramped. Sun face wall décor that's made of metal is durable. It can be made out of pewter, sterling, aluminum, and bronze among others. Depending on a unit's detailing and finish, a metal wall décor will exude a contemporary look. It may even recall a traditional ornate style. As for plastic or acrylic sun face wall accessories, they're lightweight and ideal in settings which can't support a heavy weight. An acrylic sun face can take any color and its finish may be shiny or matte. Now that you're ready to shop for a sun face wall decor that will dress up your blank walls, check out your amazing options below! Whether perched upon an entryway console or vanity, this aluminum sun-and-star-themed wall décor is a stunning homage to the ever-glorious sun. An outdoor-safe wall plaque, it's painted in dark tones with imperfections to its shape that give this wall décor a unique handmade look and feel. Also, it comes with wall hooks as mounting hardware for easy installation. If you are on the lookout for a low-key sun face wall décor, this piece from Good Directions brings class and character to hallways, bathrooms, and children's rooms. It's made of pure copper which sets the tone of a living space and commands attention at the same time. It's best paired with an enlarged black-and-white photo as it adds the right amount of color in a minimalist room. For a sophisticated and vibrant feel, hang a few pieces of this sun face wall décor in a single wall. Several pieces give an eclectic feel as nothing adds color and personality quite like a wall that's full of sun faces. Bonus: this wall decor is easier to move compared to other types of wall decor like framed paintings when you head to a brand new house. Hallways can be problematic to design. They're long, narrow, and dark, but this sun face 3D wall décor allows you to uplift your hallway with its bold look and style. Its fun poppy print with powder-coated stainless steel material that's rust resistant makes it a great addition not just to hallways but also to outdoor spaces. Give it a try today! We're starry-eyed over this extensively handcrafted stained glass and metal sun face wall décor. It lights up any living space with its bright colors which help make a small space feel more spacious or bigger. Try hanging this one with an oversized mirror to let your wall transport you to an entirely different place and era. For those who are feeling a deep spiritual connection with the star that's the source of life on earth, this meticulously crafted sun face wall decor that features a brilliant finish and hand-painted colors can be hung in any wall as your offbeat affirmation. Its material is powder coated and weather resistant metal, which means it's both great as an indoor and outdoor wall decor. This sun-themed circular installation proves that it's not always trendy to be square! It's a handmade outdoor decor that gave attention to proportion and scale. The result? Harmony in terms of design. Its harmonious look doesn't just sharpen an outdoor space's aesthetic appeal, but it also sets new layers of color. This one's a mysterious sun-themed wall decor that can fit any home and budget. There's no reason for you to limit your obsession with celestial decor, especially when this piece gives your living space a bit of humor that it may currently lack. It's made of cast aluminum that stays like new for years.